Click the image to install the brand new packaged app. We've lately been busy with working on something more than a simple feature update. 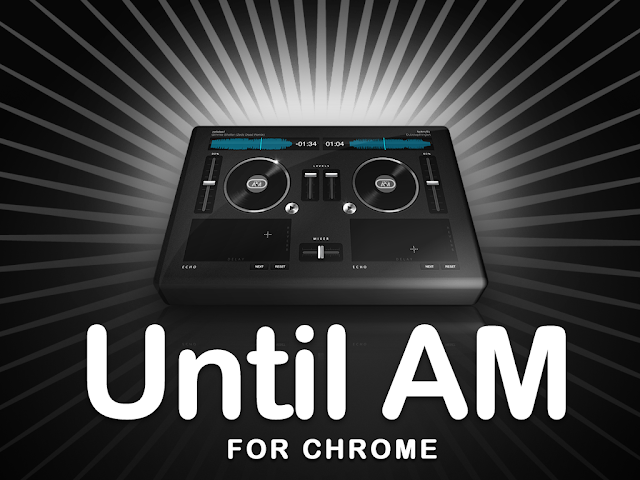 Today, we're thrilled to release a completely new app in the Chrome Web Store: Until AM for Chrome. What we're talking about is a so called packaged app, a new kind of a application made possible just recently by the red hot Chrome update. Even though you browse and install the packaged apps through the Chrome Web Store, they're in essence just like the "normal" native applications you have in the program files folder of your computer. The packaged apps run completely outside of the web browser in their own window, and also work when you're offline. At the time being, the packaged apps framework itself is still under development and you might not find our app by browsing the Chrome Web Store. However, we'd like to invite the blog readers for a sneak peek already: first make sure you have Chrome v. 28 29, then click the image above to install the app. UPDATE: The latest version requires Chrome 29 or newer, check the new post! On the surface the new app looks more or less the same as the old one, but under the hood we've remade almost everything. Instead of the Adobe Flash platform we've been using before, the packaged apps are built using the cutting edge HTML5 and in our case Web Audio technology. Obviously, this opens up exciting possibilities for the future development. We're going to publish more new stuff soon, but we simply couldn't hold back this initial version of the packaged app any more. Highly improved audio quality. With an about 30% boost to the sample rate, the effects and scratching simulation just reached a new level of exactness. Work offline. The packaged app stays installed on your computer even while you're not connected to the internet. Of course, without a web connection you can't access SoundCloud either, but nevertheless we think the offline mode is highly useful for DJs who need to spin in environments where the fibre isn't always reliable. For summer's sake, imagine a beach party for instance. Go fullscreen. The new app appears in a native window instead of a browser, so you can maximize it and avoid being disturbed by other applications while in the middle of the party. Support for WAV and Ogg Vorbis. And mp3 remains there as well, of course. The two incarnations of the app will co-exist in the Chrome Web Store. One likes the mother, another one the daughter, and it's absolutely not obligatory to switch to the new app if you prefer the old one. However, it might well be that in the near future the two apps will get more dissimilar since the underlying platforms are somewhat different and adding exactly same features might thus prove cumbersome. In any case, we'd be really happy if you'll give the new app a test drive! As always, any feedback and bug reporting is welcome e.g. via the Facebook page or e-mail! cool! !, do you plan to release an API or SDK to connect controllers? What about Firefox using Adobe Air?? any possibility or have you thought about it?? I don't have Chrome but quite possibly will check it out since I tend too Beta Whole Lotta programs many DVS/DAW/etc so please send me an invite too try it.